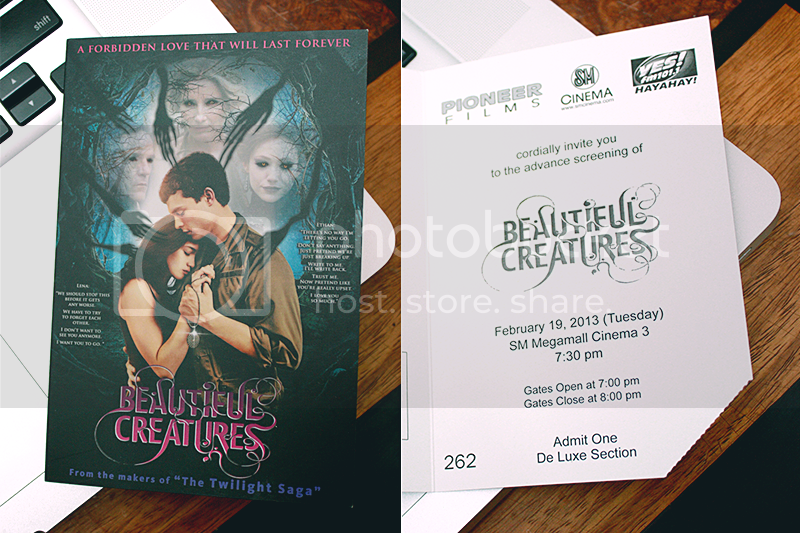 SM Cinemas, Pioneer Films, and Yes FM had their advance screening of the movie Beautiful Creatures last Tuesday. I was one of lucky few who got to attend and see it. With me was my friend, Clangsy of All Things, who was more than happy to go and watch it with me. Needless to say, the whole night never had a dull moment because the movie was more than entertaining for the both of us.. or maybe its just me who thinks so. As usual, my song choices for my mixtapes don’t match at all.. or have any consistency. Ah well. Here you go guys.. enjoy? Don’t enjoy? Don’t like it? Hope you like it? Haha. Anyway! I didn’t know you can go past 8 in adding songs, because the site is called “8tracks” after all. Apparently you can.. I would’ve added Rivermaya’s “214” and Bamboo’s “Much Has Been Said”, but I think they’re gasgas and overrated songs na. I wanted to add songs that people haven’t listened to for a long time. Forgotten songs (AFAIK) — yup. Also, most of these songs are from OPM artists. Song #6 is a new one, I found it while I’m watching Emily Owens MD. Such a bummer that the band’s 2 studio albums are not available for purchase outside their home country which is in Iceland! That’s all. Happy vday to you.. whatever the V means to you. 😛 Til the next post! Look, ma, I made an art!! Something that I have been working on since the start of the week. I wanted to try my hand on poster-making for concerts again since it’s been a very long time since I did. Practicing if I still know anything about it.. so-called “skills”. The last one I did was for the 2nd Incubus concert here in Manila. Although it did not become an official poster, some people said they liked mine better than the official poster. Haha! Anyway, yeah. 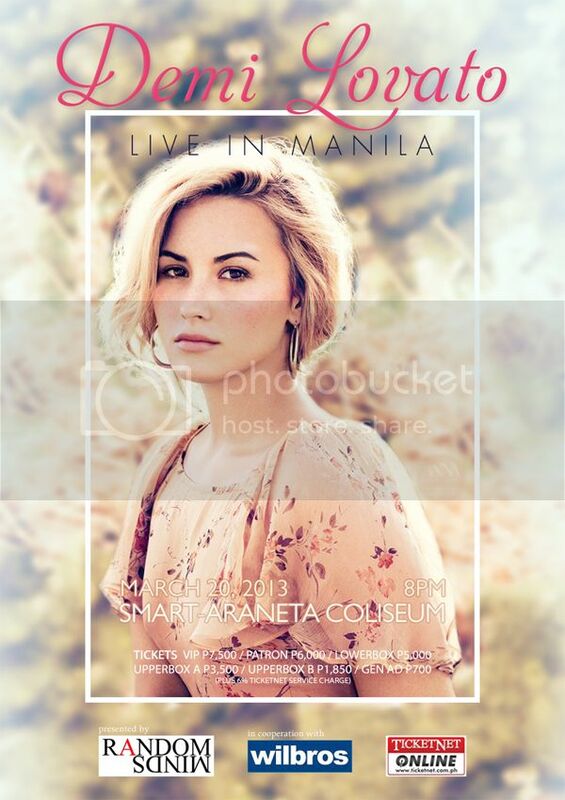 Demi Lovato’s finally coming to the Philippines next month! I’m looking forward to watching her first show here and take photos from it as well. 😀 This is the first time I made a concert poster for a female artist. And the first time I used a new style, too, I think. This is not official, this is fanmade. Feel free to share this, leave a comment or feedback about it. Just don’t remove the watermark, lol. Logos from their respective owners, copy (text) from RandomMindsProduction page at Facebook. Disclaimer: I am not affiliated with production group mentioned in any way. I just made the poster out of boredom and practice.